Blum TANDEMBOX antaro library items now available! 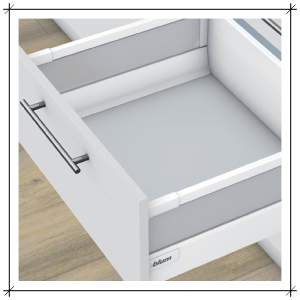 Blum’s TANDEMBOX antaro series offers an ideal drawer solution for designers and manufacturers dedicated to detail. With its minimalist design and options for colour co-ordination, the unit is certainly easy on the eye. Blum have ensured the product is easy to assemble, too; the TANDEMBOX antaro can be assembled without tools within a matter of seconds, and its 3-dimensional front adjudgment produces precise gap alignment. Height and side adjustments are a breeze though an opening on the drawer side, and tilt can be corrected with a simple twist at the front of the rail. Pytha Partners are delighted to announce that we’ve made the detailing of TANDEMBOX antaro even easier for PYTHA users, with the release of an all-new Blum Collection of library items. The PYTHA Library Blum V23a_8001 TANDEMBOX antaro (Manufacturer or Designer) collection is now available for purchase and download at My 3D Shop and we encourage you to check it out. Do you have an existing Technical Support Agreement? PYTHA users on an existing Pytha Partners Technical Support Agreement have complimentary access to this library. Simply log in to your support portal today, and we’ll lead you directly to the library items.